The work of building Spatial Data Infrastructure is in progress all over the world. There are many challenges: governance,organisational, technical, data sharing, transitional and more. We present here the fi rst part of the paper. The building of ‘Spatial Data Infrastructure’ (SDI) is being undertaken all over the world. This work involves coordinating the development of the infrastructure needed to support: the maintenance of spatial information, the utilisation of spatial information in decision making and collaboration between various parties based on spatial information. These endeavours include a wide range of challenges: regulatory, governance, policy, institutional arrangements and agreements, organisation structure and roles, skills and capabilities, technologies and technical standards, transitional and project phasing. The opportunity to use world best practice in establishing SDI should be available to everyone. Best practice needs to encapsulate the insights, lessons and experience from other nations and organisations involved in creating effective, self-sustaining modern land administration. State and private sector organisations share the mandate to establish an NSDI. The State necessarily plays a foundational role in the establishment of key building blocks of NSDI suited to land administration, as the SDI needs to tie intimately to management of land tenure. A key requirement in NSDI design is sustaining the capacity of the public and private sector entities. As an NSDI extends a framework is necessary that allows the roles of all the parties involved to be understood as a whole, for the entities to evolve themselves and for sum to be melded. 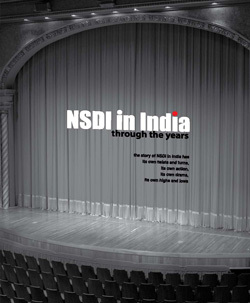 In implementing an NSDI one needs to ensure it can evolve. This allows it to be extended to address all the users’ needs, though initially may only be focused on a narrow set of users. This evolution will be encompass renovation and innovation and involve improvements in design and implementation of operational support systems. The evolution of systems requires that the underlying purpose for the design of the systems and organisations are understood i.e. their experience is institutionalised and retrograde enhancements can be avoided. The paper seeks to outline a framework for: expressing the natural boundaries of responsibility within an SDI; undertaking work in SDI that allows recognised best practice and standardised reference models to be used; managing the knowledge of why the SDI exists as it is as a basis for future extensions. This framework ensures semantic precision (a series of increasingly precise definitions for data elements in knowledge representations) and allows easy case by case instantiation (e.g. by country, by culture). It relates patterns, principles, standards, building blocks, reference models and maturity levels and allows the adoption, emphasis or abnegation of the elements in the framework in each specific implementation. This allows the framework to be common while each implementation is different with a mapping between the common framework and the specific implementation. NSDIs are complicated systems that relate to complex organisational structures. They are typically networks of systems, distributed and loosely coupled, in federated or discrete organisations, serving a multitude of purposes and audiences, support transactional and archival functions. They have all the complexities of traditional IT systems with additional concepts, data types and technologies that are not traditionally dealt in commercial solutions. So the NSDIs systems and the approaches for the implementation have the challenge of traditional large IT projects and additional challenges. Many specialists in the area look at the specific or unique, technical, social and regulatory challenges of SDI systems. They fail often to realise that not all best practice needs to be reinvented and by focusing on the details there is a risk of not seeing the forest for the trees. To address the problems effectively we need to learn from other complex disciplines better and recognise that many of the best practice that applies to these other information infrastructures applies to NSDI. Specifically we could start by looking at the generic problems associated with the implementation of complex IT systems (especially in government). –	The significance of systems architecture is not appreciated. –	Further developments in methods and tools to support the design and delivery of such projects could also help to raise success rates. In particular, basic research into complexity is required to facilitate more effective management of the increasingly complex IT projects being undertaken. –	There is an urgent need to promote the adoption of best practice amongst IT practitioners and their customers. They also identify some things that we think most people have known for some time e.g. the need for good project management and risk analysis. However both of these tasks are significantly impeded if the underlying knowledge required for analysis is not available. The NSDI is a means to assemble geographic data nationwide to serve a variety of users. The framework is a collaborative community based effort in which these commonly needed data themes are developed, maintained, and integrated by public and private organizations within a geographic area. The NSDI will provide a base or structure of relationships among data producers and users that will facilitate data sharing. The increased ability to share data through common standards and networks will, in turn, serve as a stimulus for growth. Building an effective NSDI will require a well coordinated effort among government authorities and academic institutions, as well as a broad array of private sector geographic, statistical, demographic, and other business information providers and users. Only through this cooperation will the NSDI become a reality. – by providing all parties a way of undertaking analysis, design and planning in an effective and professional manner. – by providing an explicit relationships between the outcomes, the procedures and systems, the organisations and roles, and the skills required. – it is too easy to speak of adopting best practice, everyone does, but in order to do this we really need to define what the elements of best practice are, how this knowledge is manner and provide a strategy for its adoption. That is what our SDI frameworks seek to do.